Do you ever wish there were a few more hours in the day? Before you even start on your to do list, there are the million and one other things that just have to be done to keep your family functioning and your house in some sort of order. 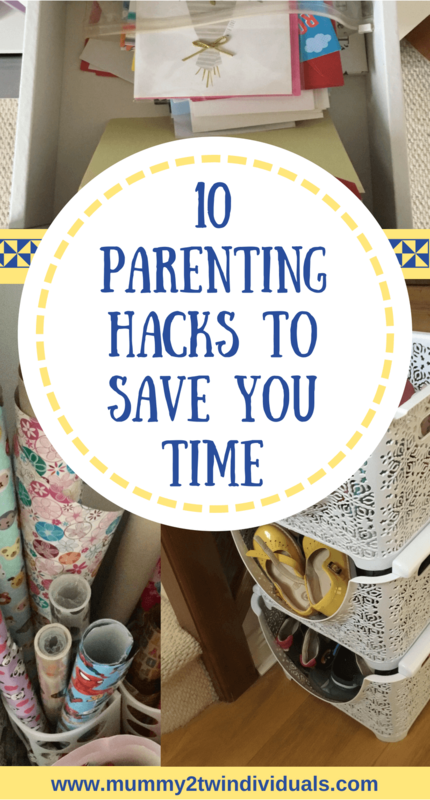 I’ve put together 10 tips that help me to stay organised and save me precious minutes here and there which all add up. 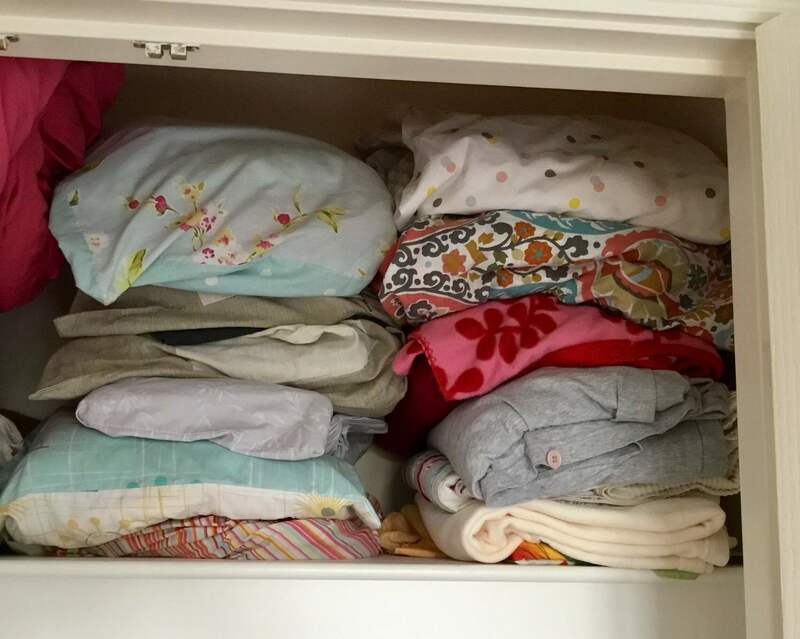 Fold all the bedding into a pile and store inside one of the pillowcases. Next time you need to change the bedding, you can grab everything you need in one go and not spend ages rummaging for the matching fitted sheet. This also helps keep your cupboard organised. Before bed, check the weather for the following day and get clothes out ready. When you’re in charge of dressing multiple people, this can really save precious morning time. It also means you can hunt down a rain coat/umbrella/sun hat or gloves depending on the forecast. With what feels like a million things to remember, it’s easy to forget the little things. Set alarms when you know you’ll have time to do something about them. 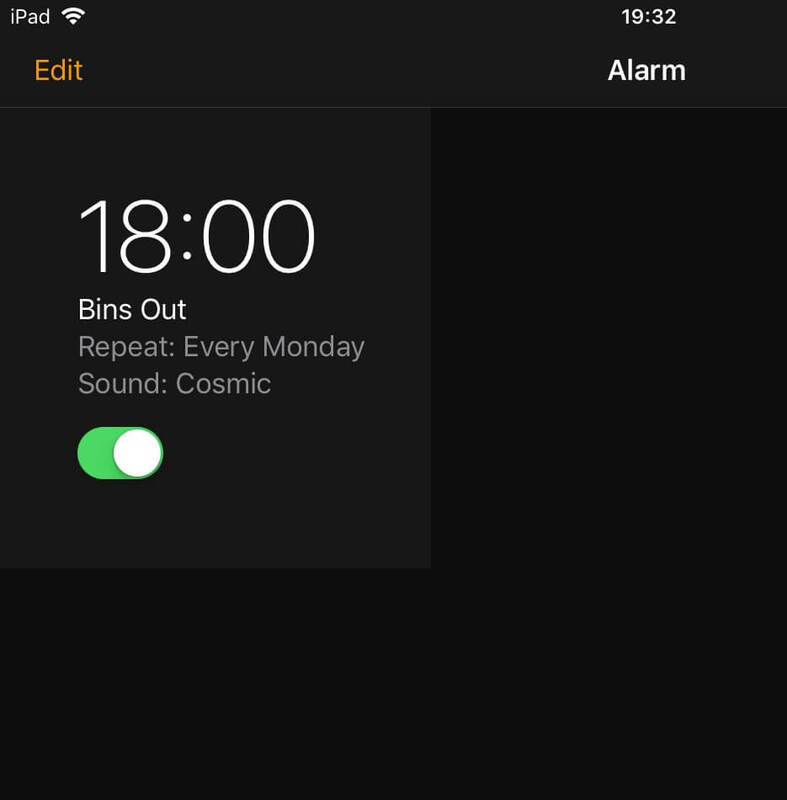 I’ve got a recurrent one for a Monday evening to remind us to put the bin out. Too many Tuesday mornings have been spent scrambling to get the recycling sorted as we hear the truck driving up the street. Ditch all the cardboard boxes. 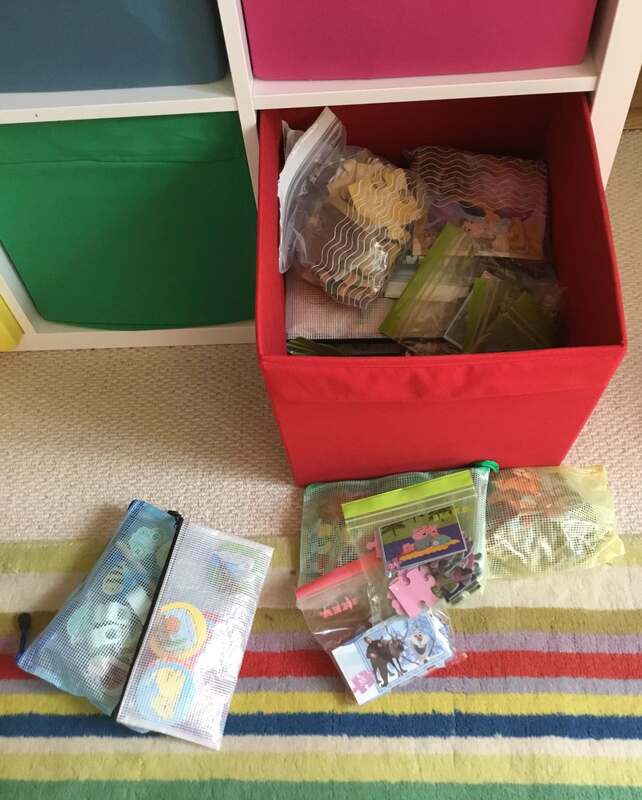 Instead cut out pictures or instructions and store games and jigsaws in ziplock bags or quality sandwich bags. They take up a lot less space, you can see what’s in them and you don’t end up trying to cram a load of crumpled boxes into a small space. Encourage little ones to hang up their own coat and shoes but giving them their own pegs and accessible shoe storage. Not only does it mean you don’t have to do this but it teaches a little independence and prepares them for when they’ll need to do this at preschool/school. We picked up colourful pegs from Ikea for a few pounds and they just stick straight to the wall. Getting everyone out the door can feel like it takes forever. The sooner we can get young ones to get on their own shoes and coat the better. I’ve still not mastered the coat but for shoes here’s a simple trick to get the right shoes on the right feet. Just cut a large sticker in half and place each piece into a different shoe so they match up when put them together. 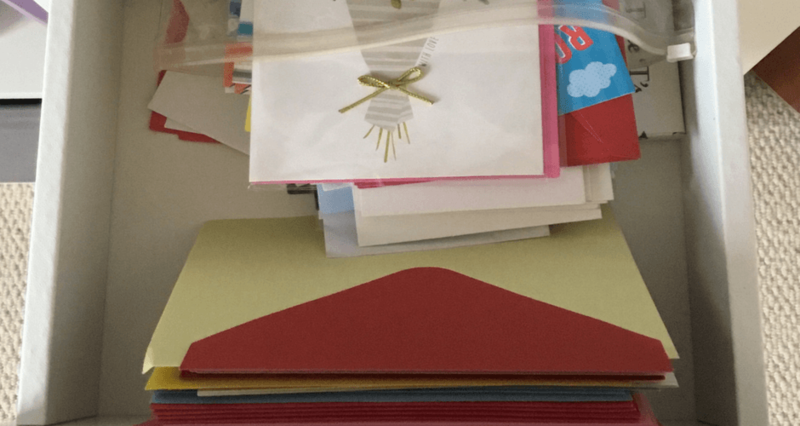 If I was super organised I’d buy all my birthday cards for the year in January. I don’t but do agree with the principal of bulk buying. So every time I know I’ll be going to a card shop, I buy at least for the next couple of months. With two girls with long hair, we have accumulated hundreds of clips, bobbles, bows, bands and hair accessories. They get everywhere. Keeping them all together is the key to not losing all of them. 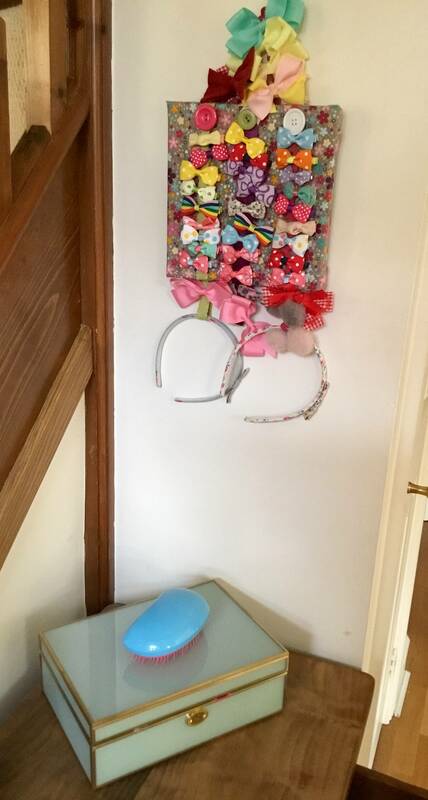 I’ve got this cute bow tidy and then keep all the clips and bobbles in a lovely jewellery box beneath. 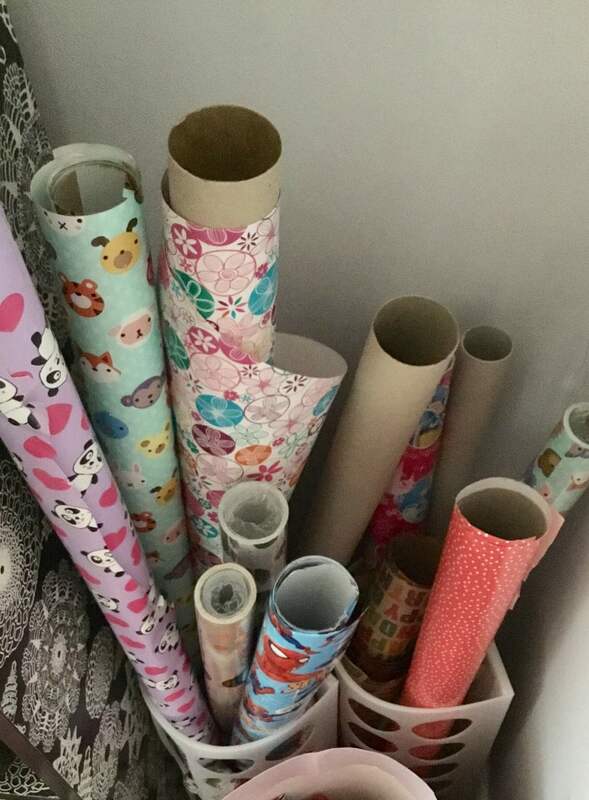 Just like cards, I bulk buy wrapping paper so we always have a selection to choose from. To keep them organised, I use one of the Ikea bag holders. This way the paper stays tidy and I can see what we’ve got. Once a week, make a meal that you can double and freeze half of. 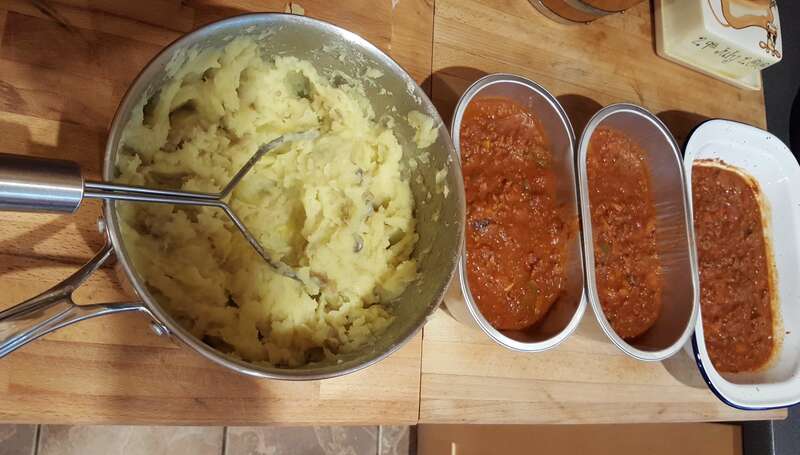 For something like spaghetti bolognese, we make a double or quadruple portion of the tomato sauce. It takes just a few minutes more to chop those couple of extra veggies but saves you loads of time when you can just grab a frozen potion to reheat. I’d love to hear if you have any time saving hacks that make your life easier. Glad you like the hacks…just got to get s9me nice big stickers now.